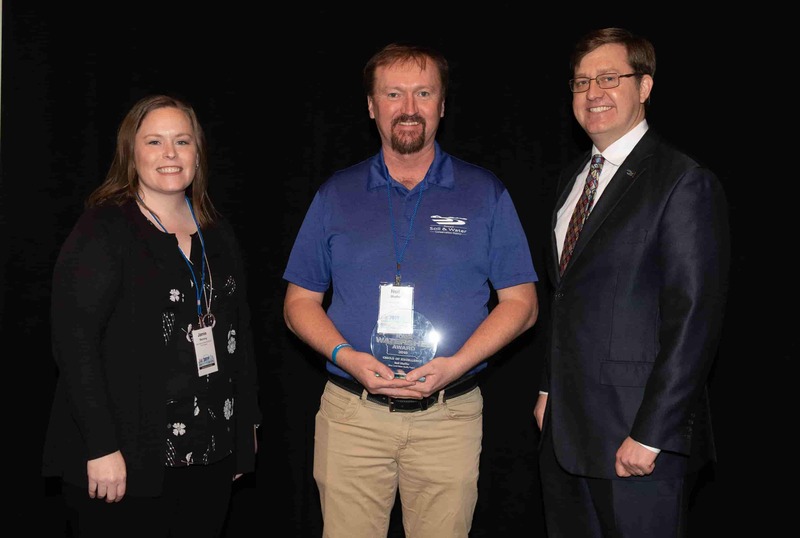 AMES, IOWA – Neil Shaffer, watershed coordinator for the Silver Creek Water Quality Project, was honored yesterday with the Circle of Excellence award from the Iowa Agriculture Water Alliance (IAWA) as part of the second annual Iowa Watershed Awards program. Shaffer was honored alongside four other watershed coordinators who also received IAWA Iowa Watershed Awards for their multitude of contributions and steadfast dedication to improving water quality across the state. Shaffer was using conservation tillage and grassed waterways on his own farm near Cresco, Iowa, before the Howard County Soil and Water Conservation District hired him 18 years ago to promote buffer strips. That led to him becoming the full-time watershed coordinator, working with many public and private partners. Water in the Silver Creek Watershed has improved enough that some landowners have reintroduced native brook trout in their streams. That improvement came after hard work to curb run-off on the farmland and livestock operations further upstream in the watershed. “We need to take care of the water before it gets to the streams,” he says. Landowners are using multiple practices to do that. In the last two years, cover crops have gone from minimal acreage to over 4,000 acres. Each year, the watershed averages an additional 25 acres of grass waterways installed which translates over 1 million square feet of new waterways every year. The project, which began in 2013, has spent almost $5.6 million on new conservation practices. Funding comes from the Natural Resources Conservation Service, Farm Services Agency, Howard County Soil and Water Conservation District (SWCD), Winneshiek County SWCD, EPA, Iowa Department of Natural Resources (DNR), Iowa Department of Agriculture and Land Stewardship (IDALS), National Association of Conservation Districts, Conservation Districts of Iowa, Pheasants Forever, Ducks Unlimited, Trout Unlimited, Howard County Board of Supervisors, Howard County Experimental Farm, and the Northeast Iowa Resource Conservation & Development. The project is also driven by local leaders, which in many cases are farmers. “When farmers come in with ideas of projects, we do our best to complete them successfully, which leads to future projects,” Shaffer says. “Every day, Neil comes in with a positive attitude and determination to be the best coordinator, staff and office in the state,” says Hunter Slifka, a district technician who works with Shaffer. “He is also very active in the community, which I believe plays a large role in his success within the watershed. Not only is he available in the office, but he is always available and open to converse about conservation outside of the office.” Shaffer is active with the local Pheasants Forever and Iowa Farm Bureau Chapters, the Norman Borlaug Heritage Foundation, and his church. Two years ago, Shaffer sold his dairy herd but still owns his farm, located along a well-traveled highway. It offers a chance to demonstrate the conservation practices that he’s helping others use to improve water quality. To help maintain momentum for this work, Shaffer will receive funding through the IAWA Iowa Watershed Awards to apply to the Silver Creek Water Quality Project as well as funding for his own professional development. IAWA developed the Iowa Watershed Awards program with Iowa State University Extension and Outreach, Conservation Districts of Iowa, IDALS, and the Iowa DNR.